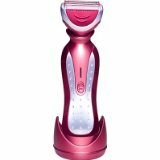 This Conair Electric Ladies Shaver will work wet or dry so you can use it while taking a bath or a shower. Also means you can clean by rinsing under running water. Features twin independent floating foils and cutters. You get 25 minutes of shaving with a full charge. Comes with a charging stand and an LED charge indicator. Get smooth close shaves with 2 full size trimmers and a pop-up trimmer. You get safe hair cutting with the 4 stage cutting system. Infiniti by Conair LWD500CS Curvations Ladies Shaver With a 360 degree Pivoting Head. 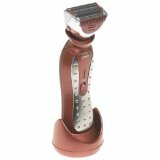 The head swivels to adjust to the contours of a ladies body to provide a close shave. You can also use in the bathtub or shower as it is a wet/dry shaver. Includes a charging stand, nonslip rubberized finish, and brushed stainless steel accents. This trimmer is rechargeable and will give you 25 minutes of continuous operation per charge.